Welcome to macromicro my online portfolio of ink art. What started on a small pad on holiday has grown into a more dedicated suite of tiny towns. Using 0.05 pens I've mixed up a myriad buildings to create unique A4 and A3 prints. After drawing buckets of doodles in my notepad I started to expand my repertoire by doing freehand stand alone flowers. Simpler than full on flowergardens, this was great for my line skills. To extend things further, I bought a compass. 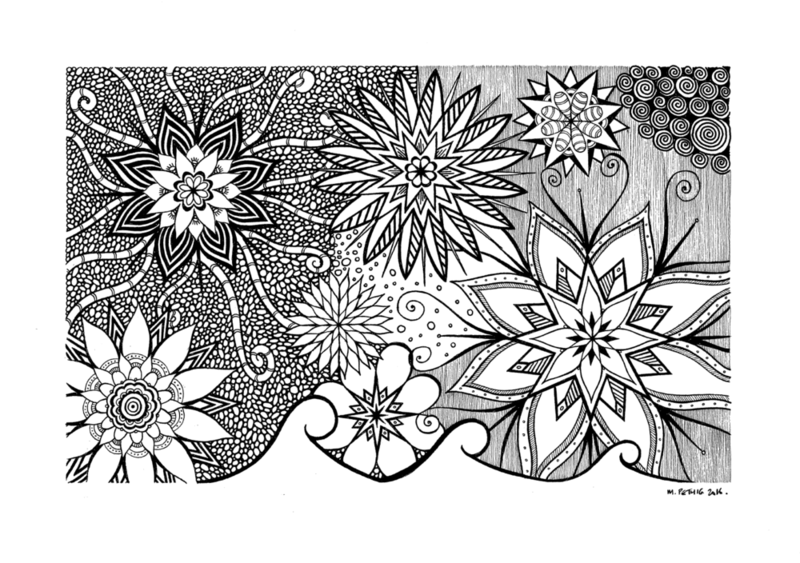 And that set off the world of mandalas. Fun, clean and micro. After running our of A4 paper at Christmas this year I had to revise some of my doodling. Using the top of a cylinder from a Blunt umbrella box I found the perfect circular frame to start working up a series of cards. Starting in the centre with a dot and just gradually moving outwards with a frame then filling it all in with patterns is something of a meditation for me. That satisfaction of sitting back and looking at a fuller picture is what these flowergardens are all about.